Something unusual has been happening in baseball as of late and it is very relevant for us over the next month. In fact, I think it portends badly for chances at rebuilding via a firesale. There has been a subtle, but substantial shift in the way the market values players. In short, baseball organizations are beginning to value their top prospects like never before. Baseball writers mention it from time to time, but I think the shift has really become evident this year. I read a chat with ESPN's Jerry Crasnick last week in which he suggested the reason for the shift was that fans had become more knowledgeable about the prospects in their organization, so GMs would come under fire if they were dealt. 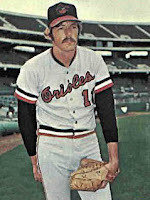 He cited Clay Bucholz of the BoSox as an example. Personally, I don't think that's the reason. In years past, top prospects were often dealt for half season rentals. 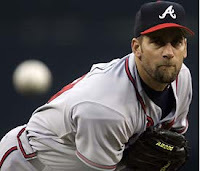 The best example that comes to mind is the Tigers trading John Smoltz to the Braves for Doyle Alexander. That trade worked out about as well as any half season rental can, as Doyle went 9-0 with a 1.53 ERA for the Tigers and helped them reach the postseason in 1987. However, those deals have become increasingly rare, as the opportunity cost of dealing blue chip prospects is higher than ever before. The cost of giving up the production of blue chip prospects has begun to heavily outweigh the benefits. If you are dealing away inexpensive prospects, then you likely have to find replacement production via free agency or trade. No matter where the replacement production comes from, it's going to more expensive than the prospect that was dealt away, because prospects are the only inexpensive production available in the market. Not to mention, the cost of replacement production for the prospects that are dealt away is skyrocketing. The average MLB salary in 1988 was $453,020 and players in their first 3 years of service time earned ~$85,000-150,000 and the top veteran pitchers were earning ~$1.75-2.0M. In 2006, the average MLB salary was $2,834,521. Players in their first 3 years of service time were earning $330-550K and veteran pitchers were making ~$10M in free agency. Over the years, salaries have increased on average about 10% per year. The difference is that a 10% increase in $100,000 salaries is much less than a corresponding 10% increase in the cost of free agents. Accordingly, the disparity between the cost of veteran free agents and the cost of prospects has grown by leaps and bounds. If you deal away a young prospect, you are throwing away three years of VERY inexpensive production and three years after that of below market production. Instead of getting good production over the next three years for ~$350-500K, you have to replace that production with expensive free agents at a cost of $10M. It costs you $9.5M more per season for the next three seasons in order to acquire a half season rental. In the past, you could find replacement production at a much lower cost, likely ~$2M in 1988. So, in 1988, the Tigers could replace Smoltz for ~$1.75M. In 2006, that same type of move would cost ~$10M. Personally, I think that it is this cost increase that has led to organization valuing their prospects MUCH more highly. They are just very reluctant to deal these types of prospects. Inflation certainly plays a part, but prospects are just a much more valuable commodity than in years past. The salary for first year players has risen 3.5 times (from ~$100K to ~$350K), but the cost of free agent pitchers has increased 5-6-7 times (from ~$2M to ~$10-12-14M). And, the cost of free agent pitchers seems likely to continue to outpace the increases in first year player salary. By trading away top notch prospects, you are incurring a huge opportunity cost, because you can no longer take advantage of 6 years of bargain priced production. Dealing away top prospects for half season rentals is becoming impracticable because the cost of replacing the future production of that prospect is exponentially higher than in seasons past. The market has begun to factor in these increasing costs and the valuation of top flight prospects has changed accordingly. In current marketplace, a player's trade value is driven by the number of years he is under the team's control and how far below the going market rate his salary is and will be. Those two factors create a kind of unique value to the team that controls their rights, which is what is desirable in the current marketplace. The value isn't created solely by the player's production anymore, but rather by the ability of the organization to obtain his production at a lower than market rate. 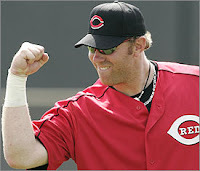 Unfortunately, that bodes poorly for us, as we are unlikely to reap a huge return for Adam Dunn. The cost of replacement production just doesn't make it feasible to rent high priced veteran players anymore. This trend seems likely to continue until the salaries at the beginning of a player's career begins to increase. Until then, dealing away top prospects is a risky proposition. That's unfortunate, given that the Reds are trying to trade Adam Dunn for young talent. At this point, I think the Reds should be willing to pay the market rate or perhaps even overpay to get certain targeted players (I'd like Jarrod Saltalamacchia and especially Matt Kemp). It's time to recognize the market shift and cut a deal with the realization that they can still be beneficial under this new market paradigm.